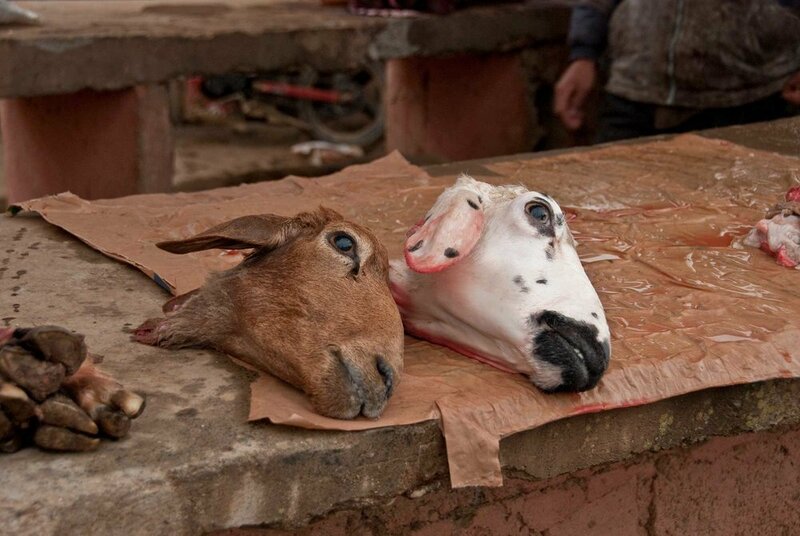 Over the hum of vehicles and cacophony of merchants loading, unloading, negotiating and haggling over their goods, the panicked wail of an animal cut through the air. The ground was wet with red mud. Moments later we rounded a corner and our eyes put visual to the sound. Chickens were being pulled from a cage and slaughtered, their meat being sold mere moments later. Goat heads were on display at one booth, and other animals I could not identify were hanging skinless in another storefront. To my sheltered Western sensibilities, seeing the processing of animals was alarming. It felt foreign and off-putting. Yet at the same time I was mesmerized by the raw and honest nature of the entire spectacle. This after all is how our food works, we just choose not to see it back home. Everything from fresh produce to cheap clothing. Spices for sale at the Amizmiz souk. Red mud. This was an experience. Fresh meat. Literally. I'm pretty sure it died a couple minutes ago. You can literally purchase a goat's head at this market. Earlier that morning we left the bustling town of Marrakech on a short-distance taxi, and transferred to long-distance taxi into the town of Amizmiz (pronounced Ahms-meez), about an hour and a half away. 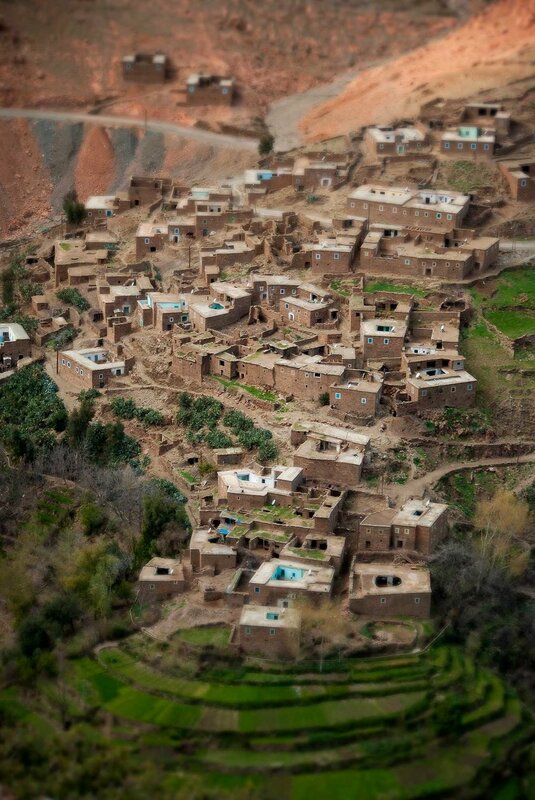 The plan was to meet up with our guide who would take us on a day hike approximately five miles into the foothills of the Atlas Mountains in Morocco. The group would dine with a traditional Berber family before heading back on foot to Amizmiz. The first stop of the day was the local souk. We had spent the last four days exploring the souk of old town in Marrakech so I thought nothing of this agenda item. Upon arrival I quickly realized that souks between different towns can vary tremendously. Here I felt like I stepped back in time—other than the piles cheaply produced clothing and plastic electronic gizmos. I was having a blast. The road out of town leads to the hills. It rained for the first thirty minutes, but then was beautiful. 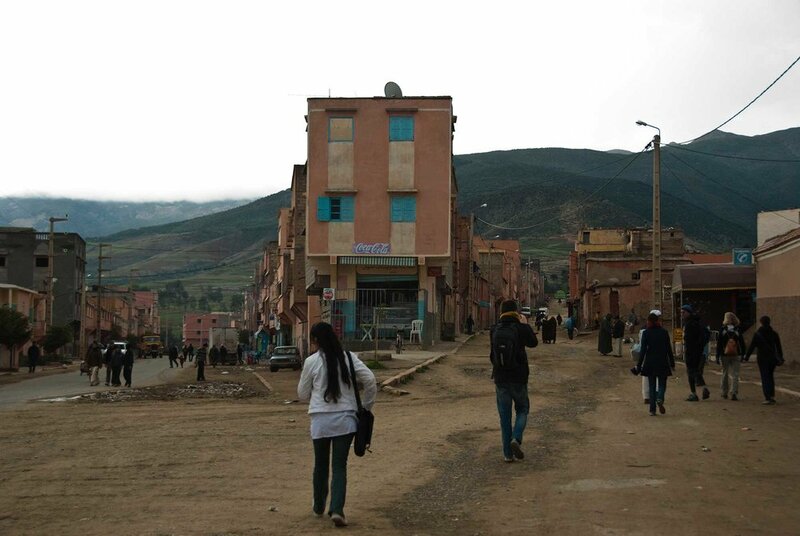 After a lap through the souk, our group of six hikers and two guides walked out of town toward the hills. The guides knew the area well, but as clients we had no map, and only a vague sense of the distance we’d be walking. Each step felt like a journey into the unknown. Where we were headed wasn’t exactly wild, but it wasn’t exactly civilized either. The trail followed streambeds for a while, then became a dirt road, then became single track that switchbacked into the steeper hills. We passes an occasional settlement and met some children playing who enjoyed the spectacle of our unfamiliar foreign faces. After the rain the clouds were ominous but we caught a glimpse of rainbow. 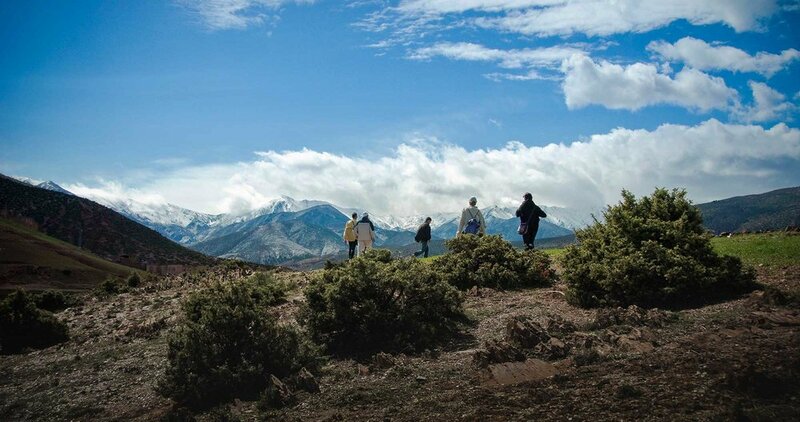 Climbing higher into the hills we spotted the snow covered peaks of the Atlas Mountains. The hike down into town was steep and the rocks were loose. Our group crested a ridge with spectacular views of snow-covered peaks in the distance and then descended into a town built on a series of terraces. A local family in this town was preparing to host us for lunch. During the descent, our guide explained that there are several of these towns in the area. Once they reach a size that can no longer be supported by the resources, subsequent couples getting married venture out to a new location and found their own towns. Our host pours mint tea for the group in the traditional way, allowing it to cool with the long pour. Seven hungry hikers don't know what they're in for. In a few minutes there would be a massive pile of food in the middle of the room. Thinking of all my electronics back home, it's clear we come from two different worlds, yet its amazing how similar we really are. You gotta be crazy to take a donkey on this trail. Our host treated us to fresh mint tea, a Moroccan specialty. After a bit of conversation assisted by our guides the host slipped out of the room. When he returned he and his wife were carrying the largest platter of food I’ve ever seen. At least two feet in diameter, this dish was piled high with chicken, goat, couscous, chickpeas and fresh baked bread. We ate until we were ready to pop and hardly made a dent in the food. Typical of the culture, our host acted offended as if we didn’t like it because we did not finish it. It is an amusing game, for had we devoured every last bit as he desired he would have felt ashamed that he didn’t provide enough. Such a goofy custom, but the warm smiles and generosity revealed the sincerity of the hospitality. After lunch we all stretched our legs and prepared for the walk back. One of the group members wanted to try her hand at riding the donkey. With narrow trail and steep drops I wasn’t going anywhere near that donkey. Our hike back took us through several small clusters of houses before returning us to the taxi depot near where we embarked. Only a few hours passed but the experience seemed somehow more important. The adventure got me outside of my comfort zone and exposed me to unfamiliar cultures and customs. I felt bolder and more adventurous. 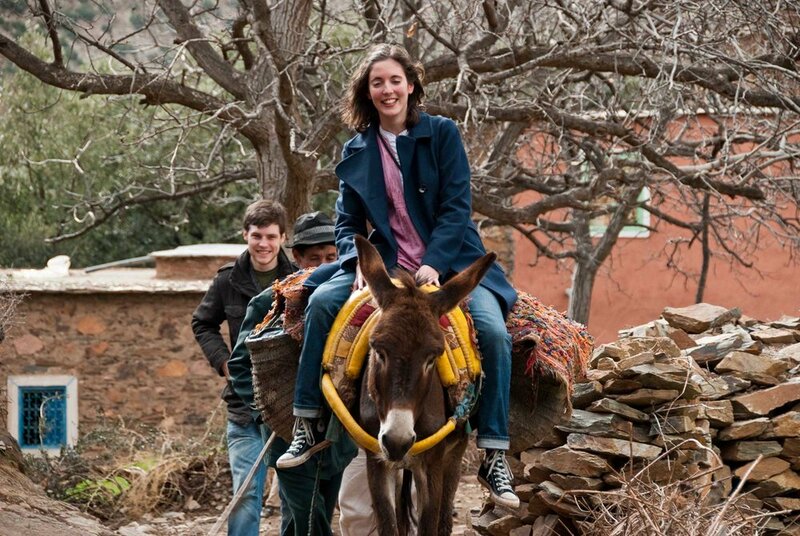 I watched the mountains slide past as we rode back to Marrakech and new that the experience had changed me. This is the approximate route our hike took. I plotted this from memory using my photos, Google Earth and Maps to cross-reference. Apologies if there are some minor inaccuracies to the route. All the more reason to hire a guide! Hire a guide. There are few signs and many trails. The guides will help you safely navigate the terrain and the locals should any issues arise. (I had a villager attempt to extract money from me for taking a photograph near him. The guide put a stop to that.) We used the crew from Berber Adventures. Choose appropriate footwear. Unless you have glass ankles, you won’t need full-on hiking boots for this hike. Sneakers or something comfortable with a decent amount of traction should be just fine. Trail runners would be perfect. Avoid wearing cotton. Should it rain (and it did on us for the first 30 minutes) you don’t want to start the day in wet cotton. You will be wet and cold all day. Instead, wear wool or synthetic clothing and you’ll not only warm up faster, you’ll dry within an hour. Pack water or camel up. Route distances vary. Be sure to bring the appropriate amount of water with you. The meal only served tea and you won’t be able to get by on tea alone. Bring a water treatment method. Water in Morocco will get you sick. It is good to have a way to purify water should you need to gather some during the hike. Chemicals, Filters, or a Steripen would all be acceptable. Sunglasses, hat, and sunscreen. Much of the hike is exposed. Do yourself a favor and protect yourself from the sun! Consider bringing a gift to the host. It doesn’t have to be anything amazing… perhaps a souvenir from your hometown.